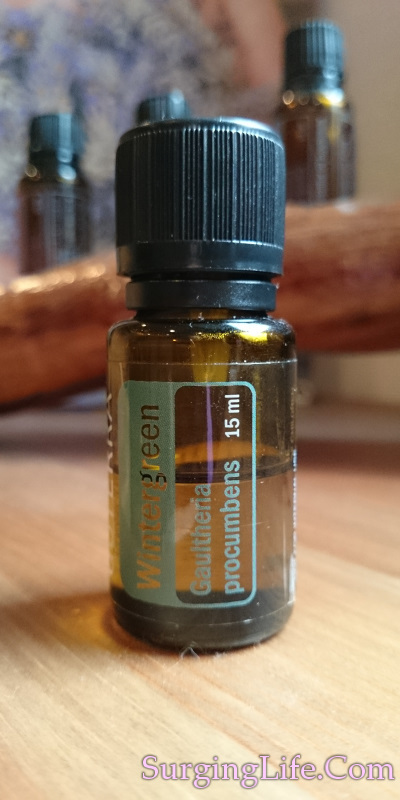 Wintergreen Essential Oil comes from the Gaultheria procumbens or Wintergreen plant. It is for pain relief though a great deal of caution should be exercised when using this essential oil due to the level of methyl salicylate it contains. That said the methyl salicylate it contains makes it very good for natural pain relief for a wide variety of conditions including Arthritis and Rheumatic issues, joint and bone conditions, Crohn's Disease and more. It also helps with various conditions in a number of other ways. You can discover more on Wintergreen Essential Oil uses and how it can aid you, alongside being a powerful reliever, below. Gaultheria procumbens is a small evergreen shrub which is a member of the Ericaceae family, which favours the acidic soils of Pine and Hardwood forests. It is native to North America growing in the area from Newfoundland west to southeastern Manitoba, and from then south to Alabama. It grows to around 15 centimeters in height. Its leaves are a dark green, 2 to 5 centimeters in length, 1 to 2 centimeters in width, and give off the distinct Wintergreen aroma. The flowers it produces are small white and bell like, and yield to produce a fruit which is a red berry like dry capsule that is from 6 to 9 millimeters in diameter. The essential oil is obtained via steam distillation from the macerated leaves of the plant. It is pale yellow or pink in colour and clear in nature, with a thin or watery viscosity. The aroma has a middle note which is strong, cooling and sweetly woody in character. The primary constituent which yields the useful properties is methyl salicylate which comprises approximately 98% of the essential oil. Other notable constituents are a-pinene, delta-3-carene, delta-cadinene, limonene, 3,7-guaiadiene and myrcene. This oil should never be taken internally. As an illustration on this, 30ml (about 1 fl oz) of Wintergreen essential oil is equivalent to 55.7g (or 171 American adult tablets) of aspirin, 1ml therefore is about the same as 6 American aspirin tablets. You should avoid the use of Wintergreen if you are taking Aspirin for anything. Internal use can cause ringing in the ears, nausea, vomiting, diarrhea, headache, stomach pain, and confusion. If you have an allergic reaction to Aspirin or have nasal polyps, you should avoid Wintergreen oil too. Those with asthma should be cautious when using it, even though it can be beneficial. The oil should also be avoided by children under 5 years of age, women who are pregnant due its emmenagogue action, and anyone who has epilepsy. The risk of severe salicylate poisoning following the ingestion of topical medicaments or aspirin. "Although the admission plasma salicylate concentrations were generally higher in subjects who had ingested aspirin tablets, the two highest readings (4.3 and 3.5 mmol/1) belonged to two of the subjects who had taken topical medicaments. Because of its liquid, concentrated form and lipid solubility, methyl salicylate poses the threat of severe, rapid-onset salicylate poisoning. The toxic potential of topical medicaments containing methyl salicylate or wintergreen oil should be fully appreciated by both physicians and the general public." The analgesic and anodyne effects are effectively the strongest properties here due to the high percentage of methyl salicylate which yields these effects. This naturally occurring compound also works as a counter irritant, and an anti-inflammatory. Whatever you are using Wintergreen oil for you will have an analgesic effect coming through. Note that the high percentage of methyl salicylate within this essential oil means that you should avoid using it if you are taking Aspirin, or if you are allergic to Aspirin. As you can see Wintergreen essential oil can be used to aid in the treatment of a very wide range of conditions. Many of them are due to the natural pain relief that this essential oil yields. Use with a carrier oil for massage will help to alleviate conditions such as Sciatica, Osteoporosis, Tendinitis and Rheumatism along with many other conditions, all known for having acute levels of pain. For bone conditions be they bruised, broken or fractured, it can help to stimulate the healing required to get the bone matter in question to heal and become good again. This is something relatively unusual in an essential oil, that said the pain relieving aspect of this oil is also something rare in an essential oil too. The primary usage is with pain relief, though it helps a wide range of conditions in this respect. It is good with healing bones and with detoxification too. In terms of all the Wintergreen essential oil uses you will get the best results from using a high quality source, the purity among other things really does make a good quality source worthwhile. Especially when getting good essential oils is easy.